At Flat Rock, we are excited about participating in Battle of the Books! This is a voluntary reading incentive program for 1st-5th grade students to encourage reading good books while having fun competing with peers. Students form 3-person teams and each person is responsible for reading 3 to 4 books on the 10-book list. Students read the books between September-February. The battle competition will take place the week of February 11-15, 2019 for 3rd - 5th grades and February 19-22, 2019 for 1st-2nd grades. Voting on their favorite book will take place during this time when the Anderson County Elections Office brings their official voting machines to our school. All K4- 2nd grade students who have read at least 8 books, and 3rd - 5th grade students who have read at least 5 books, will be able to vote (regardless of whether they compete in the Battle of the Books competition). A typical "Battle" is a tournament or game, like Jeopardy, in which students' teams earn points by answering questions about the books on the book lists. Teams are assigned competition rounds with brackets, similar to the NCAA Basketball Tournament. Grade level teams will compete against each other, and then winners from these brackets will compete against one another. The two teams with the most points will participate in the "Grand Battle," with the other teams as their audience. What are the battle books this year? The ten battle books for 3rd-5th grade during the 2018-19 are listed here. The ten battle books for 1st and 2nd grades are listed here. How does it benefit my child? The students gain knowledge and enjoyment from reading good books, sharing them with friends, parents and teachers, plus a fun day of playing in the "Battle." 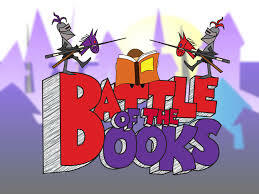 You can access further information about Battle of the Books here!